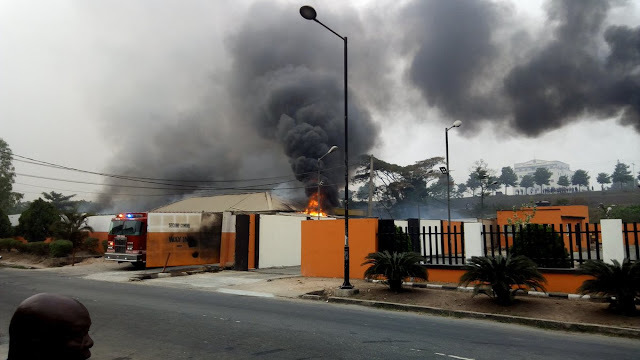 Many are feared dead as a gas explosion rocked Magodo, Lagos.The explosion that happened on Monday on CMD road, Magodo, is believed to have killed many and left many sustaining various degrees of burns. The situation was quickly put under control by the Lagos State Emergency Management Agency (LASEMA). Adesina Tiamiyi, the head of the agency said: "The agency was alerted to a fire outbreak at a Gas plant (Second Coming Nigeria Limited) Located on CMD Road, Magodo, Ikosi Isheri LCDA at about 7:26a.m. "On arrival at the scene, it was discovered that the gas plant was engulfed by the inferno. Although eyewitnesses posited that the fire outbreak could have been as a result of gas leakage from the gas plant, which was triggered by ignition of fire." "Preliminary investigation by the agency revealed that three reservoir tanks for storage of gas and one 33,000 litre gas truck in the gas station were engulfed in fire, with a secondary explosion within the gas station." "Unfortunately, two burnt bodies were recoverd behind the fence of the gas station, while eight casualties were also recorded with various degrees of burns and injuries." A lot of bodies were found littered at the scene of the explosion, many burned beyond recognition.